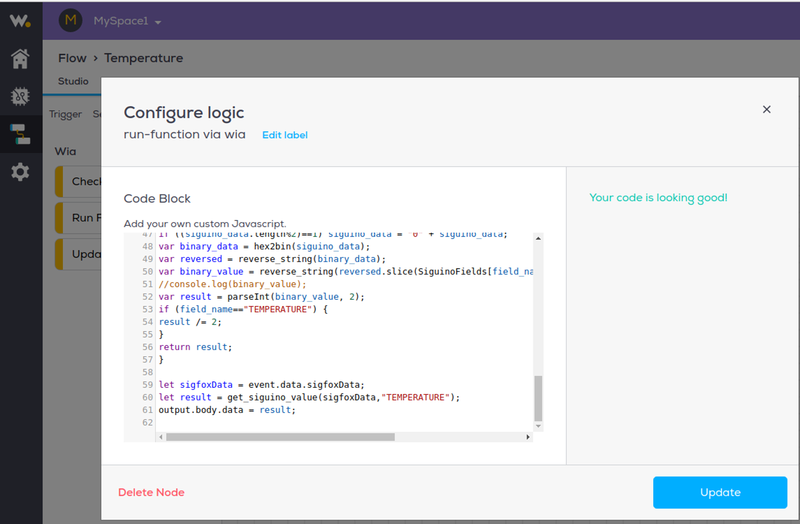 Use this guide for getting started by registering your device with Sigfox and optionally re-programming your device or integrating with Wia. Scroll down list and select your country eg. Ireland. These are included with your Siguino board. Complete your registration with your name, email & company etc. Check Terms & Conditions box. Complete “Purpose of project” and Description boxes. Sign in using the credentials created activating your device. Click Device Type in top menu. In the right hand column of the table “name” your device name is a link – click it. 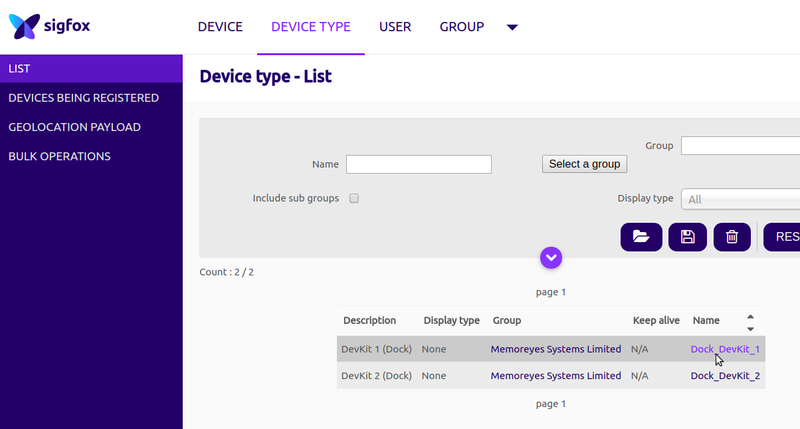 Now click “Associated Devices” on the left hand menu. The entry in the ID column (6 hex chars) of this table is also link – click it then “Messages” in the left menu. This gives a list of details of messages sent so far. You have a working Siguino sending data! 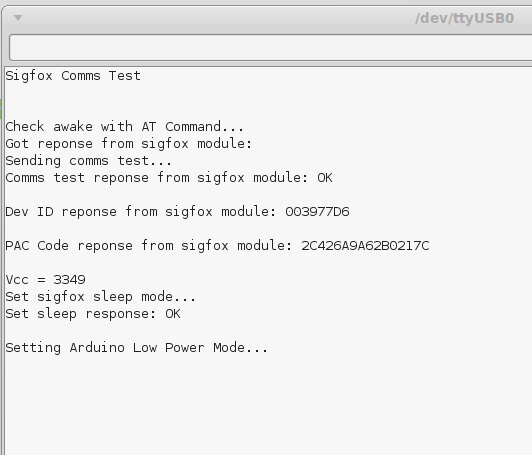 NOTE: On power-up the Siguino will send one Sigfox message containing it’s test sensor data. This will repeat every 15 minutes – a frequency that will keep it below the 140 message per day limit. Now need to make sense of the data in the next section. Enter name, email and password with 8 chars or more. Tick age checkbox. Create Your First Space. Enter name eg MySpace1 & click Create Space button. Add a device… Name: Siguino, Type: Custom, Model: Custom & click Add Device. Click settings icon (gear) from the left menu and then the “integrations” tab at top. Of the box options find Sigfox and click the power-on icon at bottom of that box. A frame will appear for API Login and API Password details from Sigfox. You will need to go back to your Sigfox web page to produce these. Return to your Sigfox page and click “Group” from top menu. Only one will be listed in the body of the page – click this one. Details of this will be shown – click API Access from left menu. Click “New” in top right-hand corner. Leave timezone Europe/Dublin (or change if needed). Select “Devices Messages” from Profile list. A page of data will appear including Login and Password details as hex strings. Copy Login and password to Wia “Setup Sigfox Integration” box input boxes. Then click “Create Integration” button. Should get success message and back to Integrations page. Back on the Wia “Integrations” page the power button should now show “On” on Sigfox box. Now we need to create a “Call back”. You will need a key from your Wia integrations page. Click the Settings ican (gear) to the right of the power-on icon in the Sigfox box on your integrations page. Your “inbound key” will be at the bottom of that frame. The rest of the page details used as below. 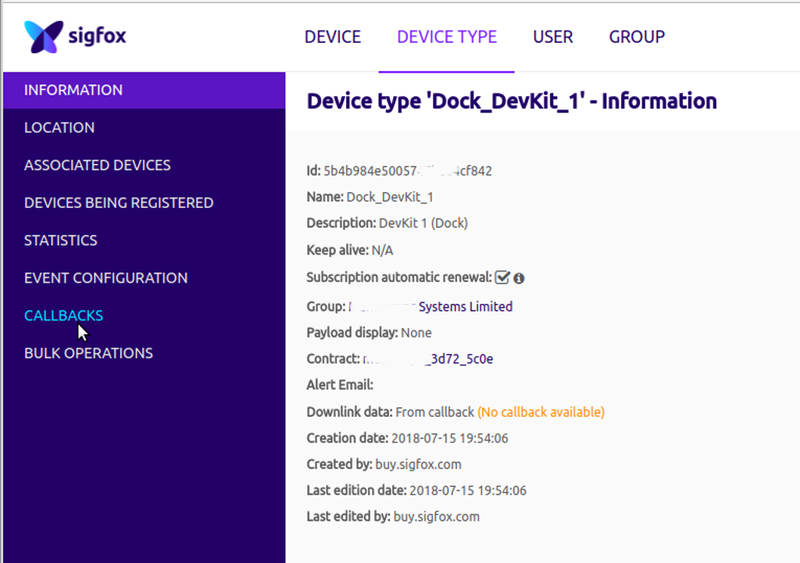 On Sigfox dashboard select “Device Type” and click on name of device in list. Click CALLBACKS in left menu. Select “Custom Callback” from list in main page. Leave default Type “DATA” / “UPLINK” & Channel “URL”. Change “Use HTTP Method” to “POST”. Replace “[YOUR INBOUND KEY]” with the Inbound Key produced above. Click “Ok” button and bottom of page. On your Wia MySpace page click the “Flows” icon in the left menu to open flows page. “Click here” to create your first flow. Enter Flow name eg. “Temperature” & click “Create Flow”. Select “Trigger” from top left horizontal menu. Drag event box to work area. Name it “sigfoxDataUplink”, Select your device from the box & click “Update” button. Select “Logic” tab from top left Trigger/Service/Logic/Action menu. Drag “Run Function” to work area. You should get “Your code is looking good” message. Click “Update” button. Add output event. Select “Action” menu on left and drag “Email” box to work area. Fill in your email address, a subject eg “My Siguino data”. 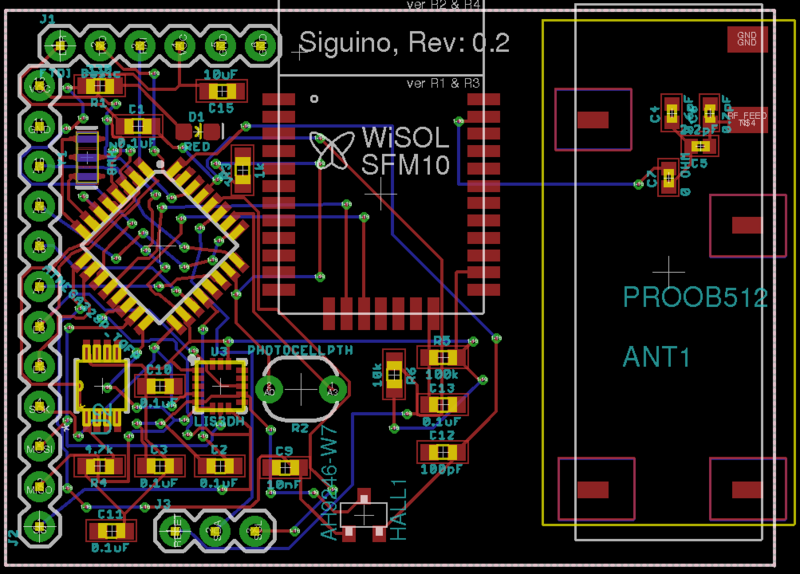 Your Siguino is capable of sending useful data and above you set it up with Wia to report temperature to you. And there are many more things you can do by adding more Wia constructs. Or by integrating with IFTTT and similar services. However, the REAL power to do almost anything you need comes from re-programming your Siguino! Dual 5V/3.3V FTDI devices are widely available for ~€15 or less. Only needed if your FTDI device does not come with one! Linux, Apple or Windows machine. 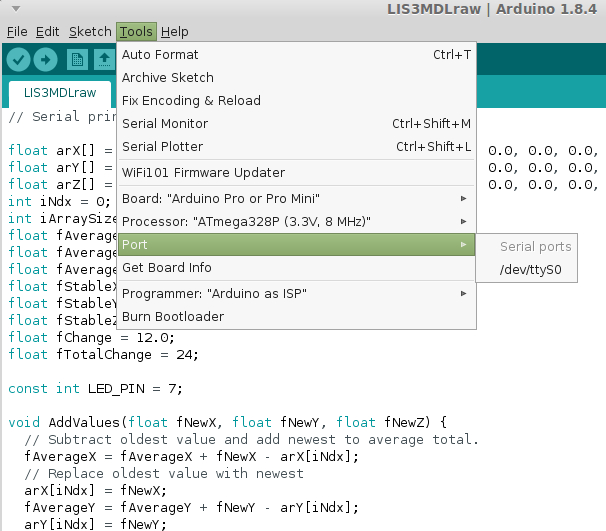 Install Arduino IDE on your development machine. Make a note of port list – you will need to select the correct port when your FTDI connects. Connect FTDI interface to Siguino board with the 6 way ribbon cable. Take care to connect the header pins in the correct order – they go in sequence. DTR at one end and Ground at the other. If dual voltage supported on your FTDI ensure the 5V / 3.3V jumper is set to 3.3V. 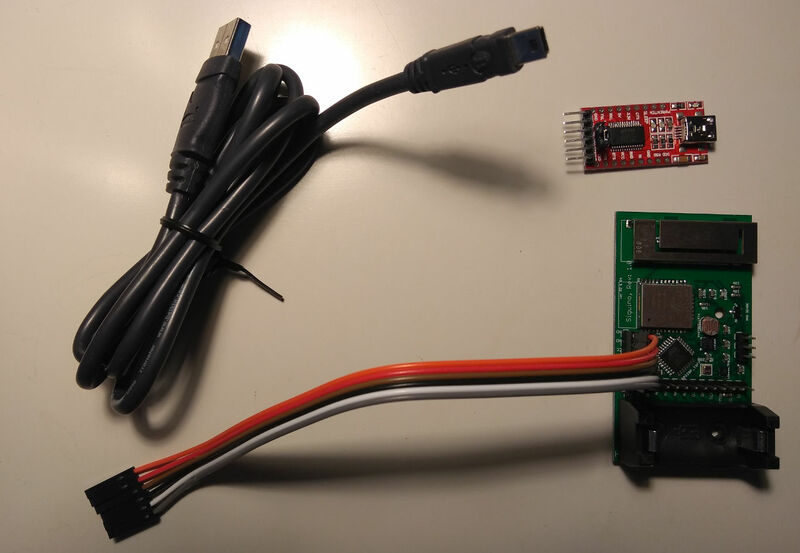 Plug the USB cable into the FTDI header and into USB port on dev machine. When powered up check the IDE menu Tools->Port again for a new entry. Select this new entry if not already selected eg. /dev/ttyUSB0 (or COM1 etc). Click IDE top right icon‭ “‬Serial Monitor‭”‬. On serial monitor window set‭ ‬9600‭ ‬baud on bottom right drop-down select box. These will be the same values used during registration. Power cycle by unplugging and re-plugging the USB cable if you missed it! This will save all code to “siguino” subdir. 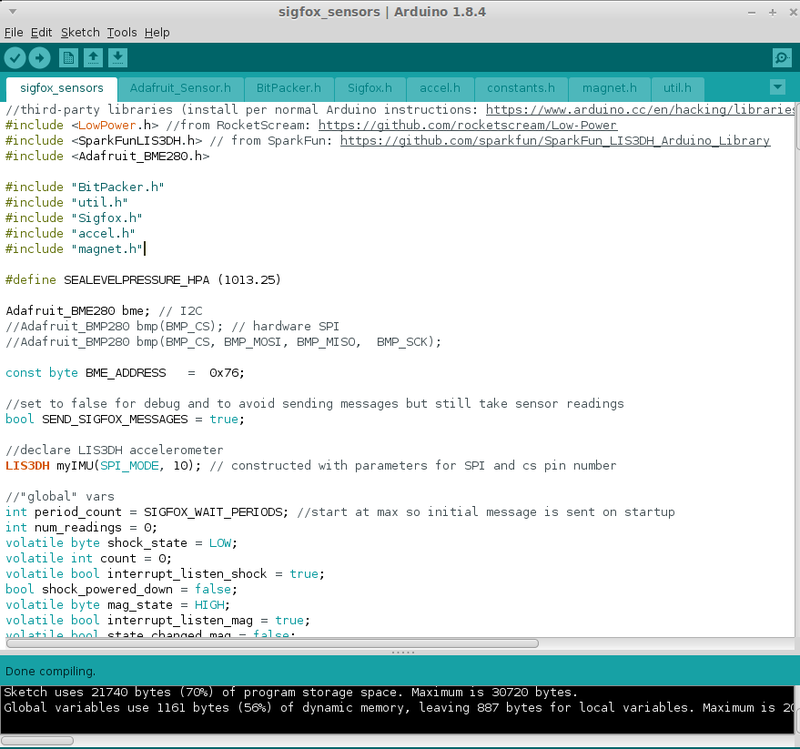 Open the Arduino IDE and Load Siguino code into Arduino dev env (tested on 1.8.4). From top menu File -> Open and navigate to ../siguino/arduino/sigfox_sensors/sigfox_sensors.ino file and click “Open”. Before you attempt to compile you will need to download required zip libraries or you will see a lot of errors. Sketch -> Include Library -> Add .ZIP Library & navigate to the file in your local download folder. Select zip file and click “Ok”. When all libraries have been included compile with “Verify” button. There should be no errors now. Ensure your Siguino is connected (see “Powering Up” above). Click right-arrow button “Upload” – this will recompile the code and if successful download it to your Siguino board. This will apply the latest version of the code that comes pre-installed in your Siguino device. You should get an email with the temperature recorded at your Siguino. Every 15 minutes!